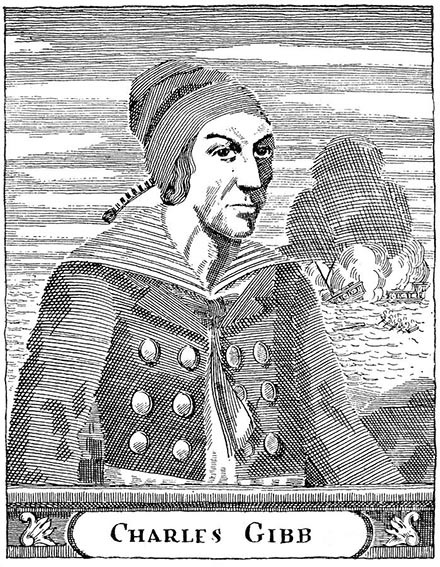 On this date in 1831, pirate Charles Gibbs hanged on Ellis Island. This Rhode Island native followed his father’s trade in buccaneering and made an adventurously brutal life on the waves during the early 19th century’s brief piracy recrudescence. Neither Gibbs himself nor subsequent writers fascinated by him shrank from embellishing his career, according to Dead Men Tell No Tales: The Life and Legends of the Pirate Charles Gibbs. Awaiting the gallows, Gibbs floated the story that he had first gone to sea under the Stars and Stripes during the War of 1812; that this turned out to be a fabrication has not prevented its repetition down the years. His first corsair crew was the Maria, a privateer out of Colombia outfitted for the independence war against Spain. Gibbs — back when he was known by his birth name, James Jeffers — joined a mutiny that overthrew the irritating shackles of a letter of marque in favor of the pleasures of independent predation. It was a fine time for such entrepreneurship; the recent upheaval of Europe’s Napoleonic Wars and the New World breakaway provinces had preoccupied the Spanish navy. For the next several years, the raiders — “principally Spaniards and Americans” — preyed on commercial shipping in the Caribbean, cruelly murdering the entire crews of their captured prizes, whose booty they would then sell in Havana. a Dutch ship from Curacao was captured, with a cargo of West India goods, and a quantity of silver plate. The passengers and crew, to the number of 30, were all destroyed, with the exception of a young female about 17, who fell upon her knees and implored Gibbs to save her life. The appeal was successful, and he promised to save her, though he knew it would lead to dangerous consequences among his crew. She was carried to Cape Antonio [Cuba], and kept there about two months; but the dissatisfaction increased until it broke out at last into open mutiny, and one of the pirates was shot by Gibbs for daring to lay hold of her with a view of beating out her brains. Gibbs was compelled in the end ot submit her fate to a council of war, at which it was decided that the preservation of their own lives made her sacrifice indispensable. He therefore acquiesced in the decision, and gave orders to have her destroyed by poison. That’s from the “Confession of Gibbs the Pirate” elicited from the condemned raiders in the days before his execution, and widely reprinted in American papers. (My quotes are from the version that appeared on April 9, 1831, in the Baltimore Patriot.) In it, the title character struggles to recall the many ships he has hijacked over the years. “Brig Jane, of Liverpool” — “Brig (name forgotten) of New York” — “Two French Brigs, in the Gulf of Mexico” — “Bark Dido, of Bremen” — “Ship Earl of Moria, of London”. Over and over his entries end with the words vessel and crew destroyed. There were some fortunate exceptions, but the pirates “knew that the principle inculcated by the old maxim that ‘dead men tell no tales’ was the only safe one for them.” Overall, his confessions involve him in “the robbery of more than forty vessels, and in the destruction of more than twenty, with their entire crews.” He might have gone to the gallows with literally hundreds of murders to his conscience. What can be said for certain is that the USS Enterprise trashed Gibbs’s pirate fleet in 1821 and sent our man fleeing on foot into the Cuban mountains. This incident aside, Americans’ naval presence was still not yet substantial enough to consistently trouble pirates. American ports, too, were quite ready to accept the coinage spent by pirates; the Spanish embassy would complain to Washington of the easy egress which Gibbs too availed. He even took a passenger ship from Boston to Liverpool where he dissipated a fortune in the vain pursuit of a respectable woman. The late 1820s find him back in his familiar habit of seagoing carnage as a privateer for Argentina in its war against Brazil. The whole Atlantic was his home, and its many conflicts each offered the prospect of regular employment (or sudden, violent death). When Argentina and Brazil made peace, Gibbs made for Algiers then under French blockade. He was, alas, unable himself to slip the blockade and thus frustrated of his design to seize Gallic prizes for the Barbary pirates. Instead, he settled for joining the crew of a brig called the Vineyard — and promptly executing a mutiny. It was for this revolt, and the murder of the captain and first officer which it entailed, that Gibbs eventually swung: the mutineers scuttled the ship and struggled ashore in Long Island, where he and his fellow mutineer Thomas J. Wansley were seized and sentenced to death at a trial in New York City. While the Vineyard was the specific matter at hand in that case, and more than sufficient on its own to condemn them, the long and bloody career that preceded it became the talk of the nation. As the foregoing excerpts will indicate, they enjoyed at least a last consolation of celebrity, for they occupied the weeks approaching execution entertaining a slew of curious visitors.